As my collection of Roleplaying game material continues and my addiction to Kickstarter project continue to grow. I come across some neat RPG concepts and some games that slipped by me. 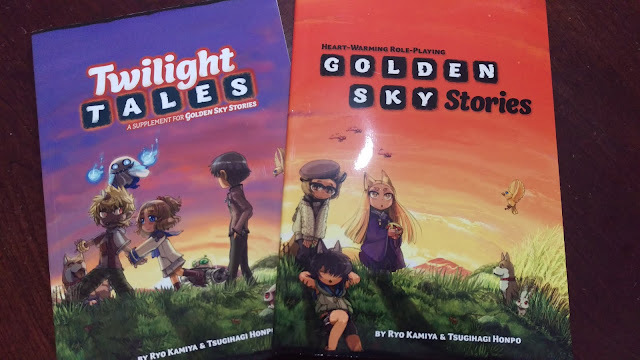 Golden Sky Stories is one of the games. The game is originally a Japanese RPG which became a translation project for a Kickstarter here in the United States a few year ago. As I said before, I missed the original Japanese version and the translated U.S. Kickstarter. I did not miss the translated expansion; Twilight Tales. I back the Kickstarter and was pleasantly surprised when it took less than 6 months for delivery of the final printed books. I also took advantage of the add-on for the project to pick up the original Golden Sky Stories in softcover. I don't know what I expected from a translated RPG but wow, the book is well laid out and easy to follow. The basic premise is that the player will choose a Henge (pronounce Hen-Gay), which is a spirit creature that resides in and around the town. The players as Henge are animal spirits that can assume human forms and human-animal forms. The players then will spend their time helping the mortal, and sometimes making things worse, but it all works out in the end and everyone gets a happy ending to the story. The Kickstarter campaign was quick and to the point, with the printed material arriving amazing quickly for a Kickstarter. If you like cute and heartwarming stories then this game is for you...if you like action and violence in your RPGs...I would look elsewhere.